Pneumonia, a lung inflammation caused by bacterial or viral infection, was both a common and a serious issue here at New Day Foster Home. It can be a mild disease, but some forms are very dangerous and require treatment in Intensive Care, especially for children whose bodies are already weakened by other health conditions. Over the previous year, particularly during the winter, we had seen a number of our children spending significant amounts of time in the ICU receiving treatment for pneumonia, causing them much suffering and seriously draining our finances. After waking from her vivid dream about pneumonia, represented by a swarm of shiny black bugs, Karen was also reminded of the promise in Isaiah 59:19 that “when the enemy comes in like a flood, The Spirit of the Lord will lift a standard against him”. She felt that it was a call for us to take our stand and to put a stake in the ground. Some research on the biblical concept of ‘a standard’ revealed that it is about identity, setting a claim and a rally point, and is ultimately about driving the enemy away! As Karen shared this dream during a morning prayer-meeting, a short-term volunteer saw a picture in their mind of a staff or stick being slammed into the ground, and rings of fire spreading out in waves, burning up all the black bugs from the dream. In the picture, the kids from the foster home were playing in the fire but it was not harming them, just killing off all of the bugs. Three years on, there have been no pneumonia cases requiring stays in the ICU. 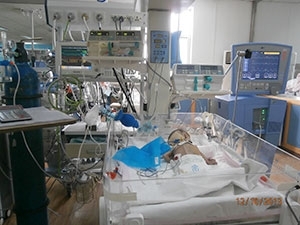 A small number of children have been diagnosed with pneumonia, but they have all been able to avoid the extended ICU stays that we were seeing so frequently prior to September 2013. Through specific, prophetic revelation, earnest prayer and the claiming of God’s promises, a standard has been raised against pneumonia, and we rejoice in His goodness!